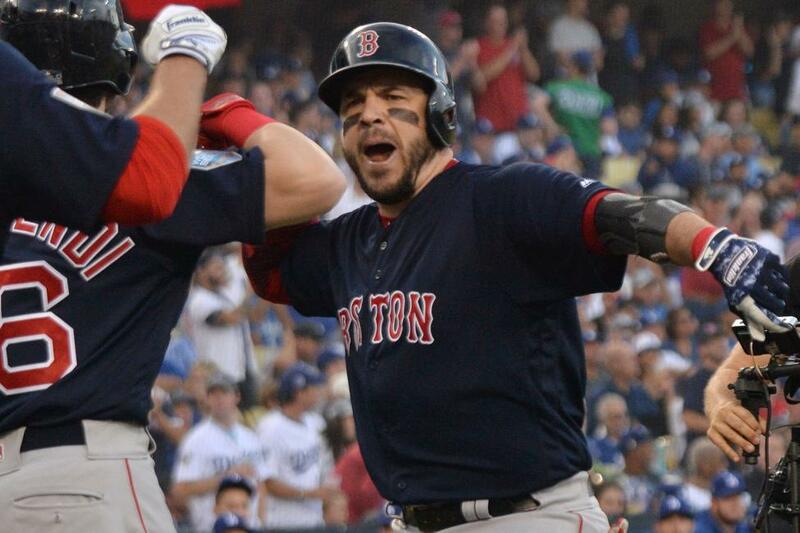 Steve Pearce hit the first pitch he saw over the left field wall for a two-run home run, helping the Boston Red Sox beat the Dodgers 5-1 in Game 5 and clinch the 2018 World Series on Sunday in Los Angeles. The 405-foot shot came off of Dodgers ace Clayton Kershaw in the top of the first inning. The Red Sox never surrendered the lead. Boston won the series 4-1 to claim its second championship in six seasons and ninth World Series in franchise history. Pearce was named the 2018 World Series MVP for his efforts during the five games. He went 4-for-12, with three home runs and eight RBIs during the series. "We are a bunch of grinders and it's awesome," Pearce told Fox Sports. "The way we play day in and day out. We expect to that out of each other. This is exactly where we knew we were going to be." Red Sox starter David Price out-dueled Kershaw in the series finale, allowing just three hits and one run in seven innings of work. Kershaw allowed seven hits and four runs in seven innings for the Dodgers. "We did everything extremely well all year long," Price said. "We stuck together. When we were going through a rough patch, nobody panicked. It was just day-to-day all year long and that was very special. Andrew Benintendi stood on first base and came home on the Pearce blast. Dodgers first baseman David Freese smacked a 402-foot solo home run in the bottom of the first frame, but the Boston bullpen silenced the Los Angeles bats for the rest of the night. Neither team plated a run from the second inning through the fifth frame, before Boston started piling on. Mookie Betts belted a solo home run in the top of the sixth frame to increase the Red Sox's lead to 3-1. J.D. Martinez led off the top of the seventh inning with another solo home run. Then Pearce returned to the plate to do some more damage in the eighth inning. The Red Sox began the frame with Betts and Benintendi getting out. Pearce then settled in for a matchup against Dodgers reliever Pedro Baez. He fouled off Baez's first offering before smashing an 86.7-mph Baez changeup over the left field fence for a 408-foot shot. The solo swat had an exit velocity of 107-mph, according to Statcast. It also gave Boston an insurmountable four-run lead. Red Sox fireballer Joe Kelly struck out the side in the bottom of the eighth inning. Boston summed star lefty Chris Sale to pitch in the bottom of the ninth inning. Sale struck out Justin Turner, Enrique Hernandez and Manny Machado to clinch the championship for the Red Sox.